Completely unfolded, the milliDelta with 12 mm-by-15 mm-20 mm roughly compares to a cent piece, and uses piezoelectric actuators and flexural joints in its three arms to control high-frequency movements of a stage on top. Credit: Wyss Institute at Harvard University. Because of their high precision and speed, Delta robots are deployed in many industrial processes, including pick-and-place assemblies, machining, welding and food packaging. Starting with the first version developed by Reymond Clavel for a chocolate factory to quickly place chocolate pralines in their packages, Delta robots use three individually controlled and lightweight arms that guide a platform to move fast and accurately in three directions. The platform is either used as a stage, similar to the ones being used in flight simulators, or coupled to a manipulating device that can, for example, grasp, move, and release objects in prescribed patterns. Over time, roboticists have designed smaller and smaller Delta robots for tasks in limited workspaces, yet shrinking them further to the millimeter scale with conventional manufacturing techniques and components has proven fruitless. 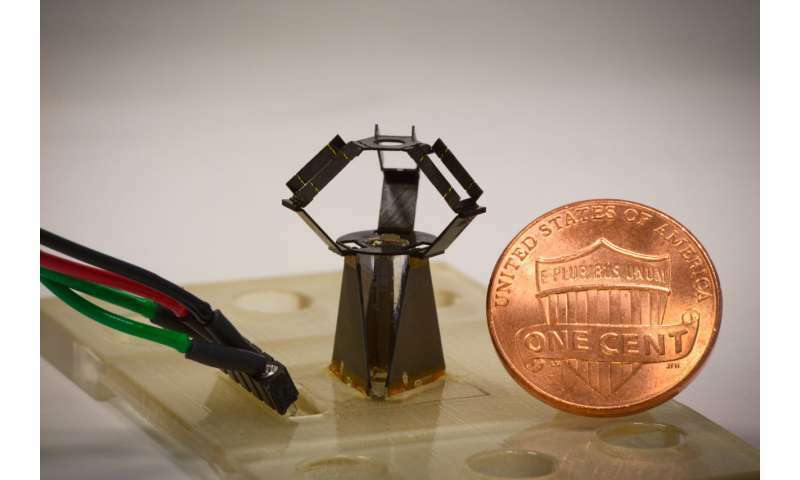 Reported in Science Robotics, a new design, the milliDelta robot, developed by Robert Wood's team at Harvard's Wyss Institute for Biologically Inspired Engineering and John A. Paulson School of Engineering and Applied Sciences (SEAS) overcomes this miniaturization challenge. By integrating their microfabrication technique with high-performance composite materials that can incorporate flexural joints and bending actuators, the milliDelta can operate with high speed, force, and micrometer precision, which make it compatible with a range of micromanipulation tasks in manufacturing and medicine. In 2011, inspired by pop-up books and origami, Wood's team developed a micro-fabrication approach that enables the assembly of robots from flat sheets of composite materials. 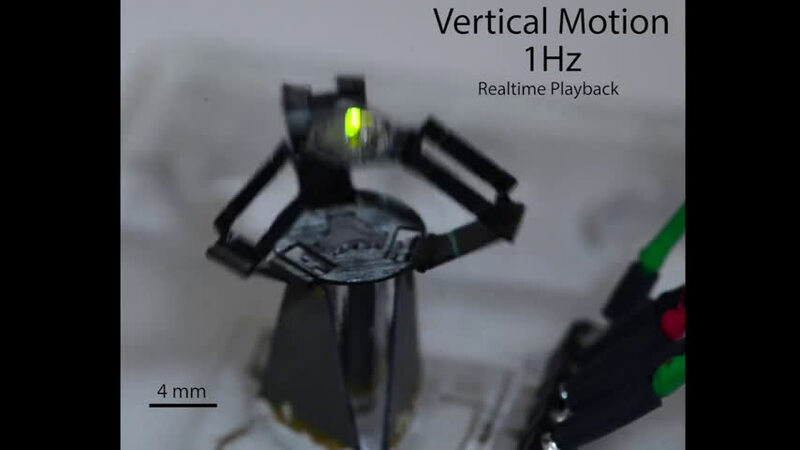 Pop-up MEMS (short for "microelectromechanical systems") manufacturing has since been used for the construction of dynamic centimeter-scale machines that can simply walk away, or, as in the case of the RoboBee, can fly. In their new study, the researchers applied their approach to develop a Delta robot measuring a mere 15 mm-by-15 mm-by-20 mm. "The physics of scaling told us that bringing down the size of Delta robots would increase their speed and acceleration, and pop-up MEMS manufacturing with its ability to use any material or combination of materials seemed an ideal way to attack this problem," said Wood, who is a Core Faculty member at the Wyss Institute and co-leader of its Bioinspired Robotics platform. Wood is also the Charles River Professor of Engineering and Applied Sciences at SEAS. "This approach also allowed us to rapidly go through a number of iterations that led us to the final milliDelta." The milliDelta design incorporates a composite laminate structure with embedded flexural joints that approximate the more complicated joints found in large scale Delta robots. "With the help of an assembly jig, this laminate can be precisely folded into a millimeter-scale Delta robot. 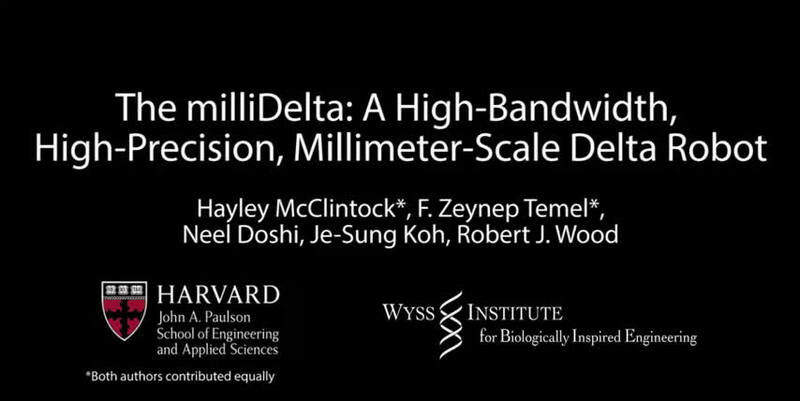 The milliDelta also utilizes piezoelectric actuators, which allow it to perform movements at frequencies 15 to 20 times higher than those of other currently available Delta robots," said first-author Hayley McClintock, a Wyss Institute Staff Researcher on Wood's team. In addition, the team demonstrated that the milliDelta can operate in a workspace of about seven cubic millimeters and that it can apply forces and exhibit trajectories that, together with its high frequencies, could make it ideal for micromanipulations in industrial pick-and-place processes and microscopic surgeries such as retinal microsurgeries performed on the human eye. 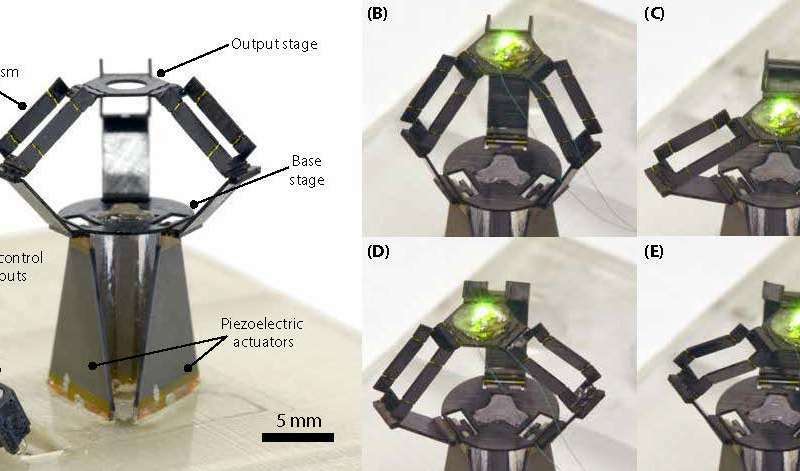 Putting the milliDelta's potential for microsurgeries and other micromanipulations to a first test, the researchers explored their robot as a hand tremor-cancelling device. "We first mapped the paths that the tip of a toothpick circumscribed when held by an individual, computed those, and fed them into the milliDelta robot, which was able to match and cancel them out," said co-first author Fatma Zeynep Temel, Ph.D., a SEAS Postdoctoral Fellow in Wood's team. The researchers think that specialized milliDelta robots could either be added on to existing robotic devices, or be developed as standalone devices like, for example, platforms for the manipulation of cells in research and clinical laboratories. "The work by Wood's team demonstrating the enhanced speed and control of their milliDelta robot at the millimeter scale opens entirely new avenues of development for industrial and medical robots, which are currently beyond the reach of existing technologies. It's yet another example of how our Bioinspired Robotics platform is leading the way into the future," said Wyss Institute Founding Director Donald Ingber, M.D., Ph.D., who is also the Judah Folkman Professor of Vascular Biology at HMS and the Vascular Biology Program at Boston Children's Hospital, as well as Professor of Bioengineering at SEAS.